This section of Awaba deals with people, past and present, who are either Awabakal, or have played a role in the Aboriginal history of the Newcastle Lake Macquarie region. 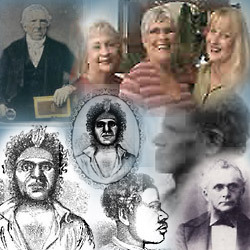 Numerous local Aboriginal characters made their mark in the records of the invader. The most famous is Birabahn, already a celebrated figure in Sydney before his long association with Threlkeld and the Lake Macquarie mission. Later in the century, there were locally notable figures such as "Old Ned" and his wife, Margaret of the Awabakal, who remain strong in the memory of contemporary Aboriginal and non-Aboriginal communities. There are many non-Aborigines who made notable contributions to the history and understanding of the region's Aboriginal population, particularly Reverend L.E. Threlkeld (1788-1859), whose biography has already been authoritatively written by Niel Gunson (Gunson 1966b; Gunson 1974) and earlier by Dr. Ben W. Champion in the Royal Australian Historical Society Journal in 1939 (Champion 1939). Others, whose biographies are given here, include Reverend Dr John Fraser, Walter John Enright and Percy Haslam. In "The True Descendants from the Awabakal Tribe", Nola, Leah and Kerrie (nee Powell) describe their family history and the pursuit of their great-great-grandparents, Margaret and Ned.